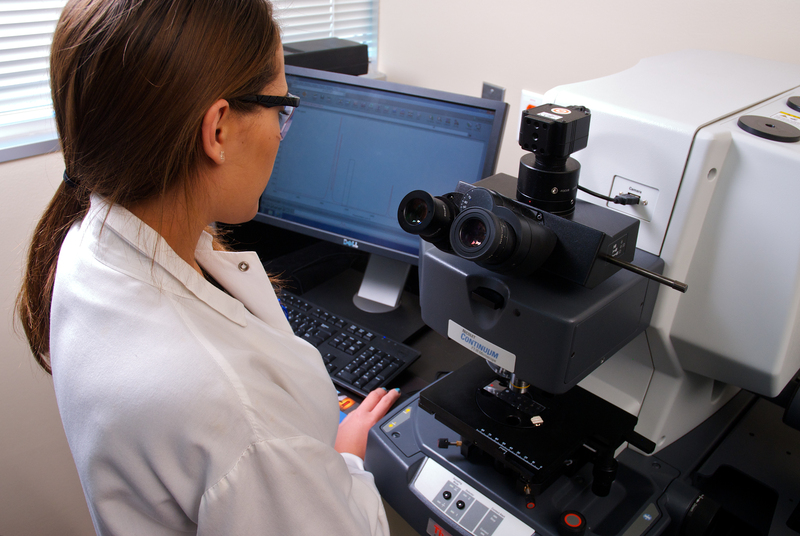 Analyst performing FTIR Test to identify residuals. When dealing with orthopedic medical devices, even small changes in the manufacturing process or device materials can impact patient safety. With these changes comes the risk of introducing new compounds that may leave residue on the device or leach harmful compounds that put the patient at risk. Because of the high patient risk, the biocompatibility of the device must be re-evaluated after any change. The most thorough method to determine the effect of a change is to repeat the biocompatibility tests that were performed in the original submission to bring the device to market. However, this can be costly and time-intensive. One alternative is chemical characterization testing. Chemical characterization test methods characterize the device materials and determine the compounds that may leach or extract from the device. Chemical characterization, combined with specific biocompatibility tests, is a more cost effective and efficient way to evaluate the impact of a change in the manufacture of a device. Common changes orthopedic device manufacturers encounter are generally outside of their control. These changes include alterations to the device material or vendor supply. Internal changes are also implemented to improve the device or the manufacturing process which can impact the biocompatibility of the device. Evaluate any new material or compounds that could be introduced to the patient as a result of that change. Evaluate how much the change affects the patient contacting portion of the device. If the affected portion of the device does not have direct patient contact there may be less testing required than a change that would affect the direct patient contacting surface areas of the device. If a processing change has occurred, evaluate whether or not the new process removes residuals as effectively as the original process. Because every orthopedic device is unique, there are many ways to assess the impact of a change. The potential impact to the patient must be evaluated with any change and chemical characterization is one way manufactures can evaluate that change. Chemical characterization testing is most effective when the original device configuration is compared to the device after a change has occurred. If the characterization of the two devices is shown to be similar, fewer biocompatibility tests may need to be repeated. A test plan, along with a risk assessment, is the most successful approach to take when evaluating the impact of a change to the overall biocompatibility and patient safety of a device. For more information on using chemical characterization to evaluate changes in medical device manufacturing we recommend Thor Rollins’ and Alexa Tatarian’s ODT Magazine article, “How to Approach Change in Orthopedic Device Manufacturing,” as well as their complimentary on-demand webinar, “The Power of Chemical Characterization to Assess Changes.” You may also visit Nelson Labs online at www.nelsonlabs.com for more information about our biocompatibility testing laboratory services.